Vaughan Roberts takes us to the heart of the Christian message in his warm, clear and engaging style. 4.1" x 5.8" x 0"
I was very pleased with this booklet. It was well written and presented and perfect to give away to parents at our Parent and Toddler group Christmas event. This is a brilliant booklet to give away at Christmas. The gospel message is clearly presented through the events of the first Christmas in Vaughan Roberts laid back, easy read style. Well written and helpfully illustrated - a quality product. Best suited to student-type contacts. The message is helpfully simple - Christmas is historical: it really happened, joyful and it really matters. Draws on helpful quotations - from Harrod's to Sting - but is rooted in the Bible. Some readers may not get to the end but for those who do will find a helpful prayer and four helpful steps to take in order to grow your faith. An easy read for someone who is asking questions about Christian faith. I especially like the emphasis on "historical" as most people under 40 think Jesus is about as historical as Santa Claus! Well presented and attractive to give away. I found the booklet a fantastic outline of the gospel - I was also happy that it encouraged readers to take a look at The Word itself, rather than simply be peppered with bible quotes. It has been easy to pass on to colleagues, visitors and friends. I ordered mine early this year and having them on my kitchen table in preparation for Christmas card writing has certainly caught people's attention and sparked conversation! I had planned to give this to our God-daughter, but did not once it arrived. The first page put me off. It was the "Christmas in three words". A good idea, but then the 3 words were not punchy and prevented me from wanting to read on. Now that I have read on in order to review it, I think that the words are very well chosen. I want to send it to our God-daughter in retrospect, with an apology for page 1. 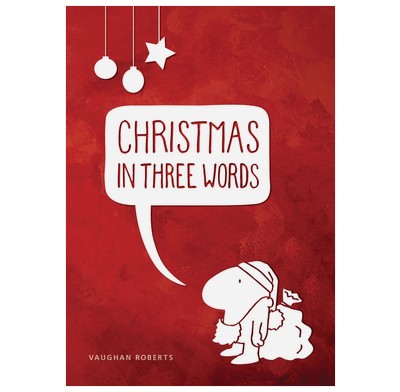 I think you need to think of a different title from "Christmas in 3 words", because "Historical, joyful and essential" just don't pack a punch. They are fine, though, as sub-headings for the text. Good front cover and illustrations. This little booklet is very much Vaughan Roberts - presented simply but in detail. It gives the reader a good insight to the Christmas story with a call to faith in the Christ of Christmas. I give it to homes where I visit to give a Christain calendar and I leave with the confidence that the booklet will leave the reader in no doubt as to the Gospel of Jesus Christ. This is a fantastic book to read. Clear message about Christmas, I'm going to mention it to my vicar to see about giving it out for Christmas this year. I really felt that the information was really good and easy to understand. An excellent booklet - both content and size were important. I was able to send one to each of a number of neighbours with their Christmas card. Now - what can you do for next year ? !